Bienvenidos! 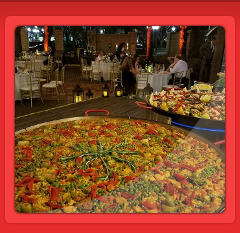 Our Spanish paella catering company prepares paella on-site making your special event, exciting and memorable. Fresh and bursting with flavor, that's what Señor Pepe's Paella takes pride in offering! 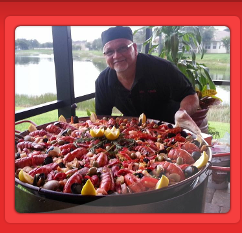 We provide great tasting authentic paella. Prepared with the highest quality and fresh ingredients, we offer real, open fire paellas. Made with the world’s best "Bomba" or "Calasparra" paella rice imported from Murcia Spain, Spanish azafran-saffron, freshly made Spanish chorizo (sausage) made in its traditional way using all the seasonings and spices used in Spain. Extra virgin olive oil, Spanish Pimenton (paprika). 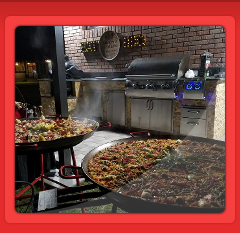 We also use locally grown produce, fish and seafood making this authentic paella one of the best options for a large party or private dinner and all prepared at the comfort of your home, backyard, pool deck, park pavilion, reception hall, beach or any location your venue is being celebrated. We have a 20 person minimum so please, book early. We service all of Florida. Contact us today to find out more. limited dates available, especially during Holiday season. A deposit is required to hold selected date of event. We accept Visa, Mastercard, American Express & Discover cards. Corporate and Personal checks also accepted. Please call or text 239-464-7180 for information. 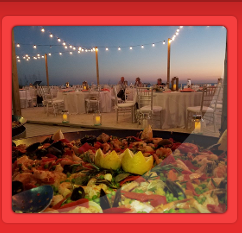 Book early for large events and special orders. We will do our very best to assist you with any last minute (short notice) events. Remember it's important to book early, dates are limited.